The National Transportation Safety Board (NTSB) has released a preliminary report regarding the Uber self-driving car that struck and killed a pedestrian in Tempe, Arizona. The report lays out the details the NTSB has gathered since the crash, which occurred on March 18. The report does not delve into probable cause, but it confirms that the sensors on the vehicle worked as expected. The problem, says the NTSB, was that Uber’s software became confused by the pedestrian. Uber’s sensors spotted Elaine Herzberg about six seconds prior to impact -- enough time for the vehicle to brake and avoid hitting the woman. However, the system had a hard time figuring out what she was. At the time of the crash, Herzberg was dressed in dark clothing and pushing a bicycle with no side reflectors. Herzberg didn’t look in the direction of the oncoming vehicle “until just before impact.” Toxicology test results of the pedestrian came back positive for marijuana and methamphetamine, the report noted. "As the vehicle and pedestrian paths converged, the self-driving system software classified the pedestrian as an unknown object, as a vehicle, and then as a bicycle with varying expectations of future travel path," the report says. It wasn’t until 1.3 seconds before impact that the vehicle’s self-driving system "determined that an emergency braking maneuver was needed to mitigate a collision," NTSB explained. However, automatic emergency braking maneuvers in Uber’s Volvo XC90 were disabled while the car was in self-driving mode in order to “reduce the potential for erratic vehicle behavior.” The system is not designed to alert the driver that braking is needed. Uber safety driver Rafaela Vasquez intervened “less than a second” before impact by grabbing the steering wheel. She hit the brakes less than a second after impact. Vasquez told investigators she had been “monitoring the self-driving system interface” before the crash, not looking down at her phone as a video released by Tempe police appeared to show. The NTSB is continuing to collect information on the fatal crash, including the Uber self-driving system, the Volvo’s operator interface, the operator, the operator’s cell phones, the pedestrian, and the road. 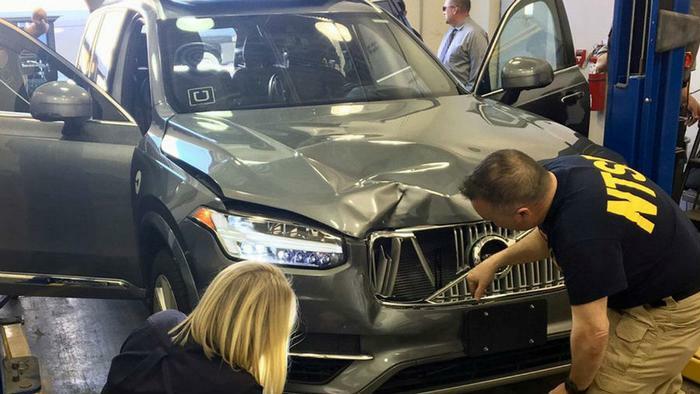 After the crash, Uber suspended its autonomous vehicle testing and Arizona governor Doug Ducey -- who had initially welcomed Uber’s test program to the state “with opens arms and open roads” -- revoked the company’s permission to test vehicles in the state. Yesterday, Uber announced it was shuttering its test program in Arizona. The company said its self-driving program would be “limited” in the months to come.